Lynne Cameron is Professor of Applied Linguistics at the Centre for Language and Communication, The Open University. Robert Maslen is a Research Associate at the Centre for Language and Communication, The Open University. He gained his PhD in language acquisition from the Department of Psychology, University of Manchester (with funding from the Max Planck Institute for Evolutionary Anthropology in Leipzig). His work in applied linguistics has included research on terrorism risk communications and the expression of empathy in discourse. Metaphor is recognised as an important way of thinking – constructing analogies and making connections between ideas – and an important way of using language – to explain abstract ideas or to find indirect but powerful ways of conveying feelings. By investigating people’s use of metaphors, we can better understand their emotions, attitudes and conceptualisations, as individuals and as participants in social life. This book describes practice in the analysis of metaphor in real-world discourse. When real-world language use is taken as the site of metaphor study, researchers face methodological issues that have only recently begun to be addressed. 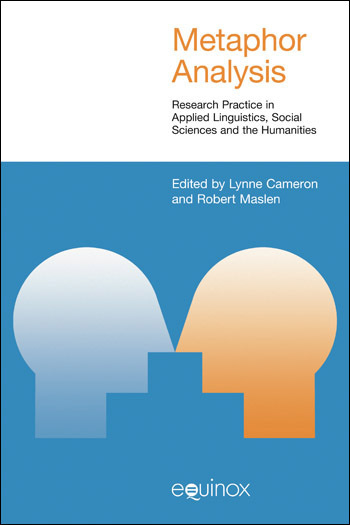 The contributors to this volume have all had to find ways to deal with methodological issues in their own research and have developed techniques that are brought together here. Using as a basis the discourse dynamics approach to metaphor developed by the editor, the book explores links between theory and empirical investigation, exemplifies data analysis and discusses issues in research design and practice. Particular attention is paid to the processes of metaphor identification, categorisation and labelling, and to the use of corpus linguistic and other computer-assisted methods. Metaphor is recognised as an important way of thinking – constructing analogies and making connections between ideas – and an important way of using language – to explain abstract ideas or to find indirect but powerful ways of conveying feelings. By investigating people’s use of metaphors, we can better understand their emotions, attitudes and conceptualisations, as individuals and as participants in social life. 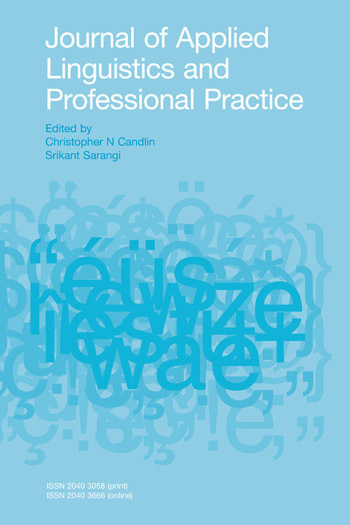 This book describes practice in the analysis of metaphor in real-world discourse. When real-world language use is taken as the site of metaphor study, researchers face methodological issues that have only recently begun to be addressed. The contributors to this volume have all had to find ways to deal with methodological issues in their own research and have developed techniques that are brought together here. Using as a basis the discourse dynamics approach to metaphor developed by the editor, the book explores links between theory and empirical investigation, exemplifies data analysis and discusses issues in research design and practice. Particular attention is paid to the processes of metaphor identification, categorisation and labelling, and to the use of corpus linguistic and other computer-assisted methods. This chapter introduces metaphor as seeing one thing in terms of another, a multi-dimensional discourse phenomenon that involves language, thinking, physicality, and social interaction. It then demonstrates how metaphor can be used as a research tool to open up discourse data and reveal something of people’s ideas and attitudes and values. Cameron summarizes her empirical study of metaphor and reconciliation, in which metaphor analysis helped to uncover the strategies by which former enemies came to understand each other. Graham Low is an applied linguist. He has an MA in Linguistics from Manchester and a PhD in Educational Studies (focusing on methodological aspects of questionnaire design) from York. He has taught in secondary, further and higher education in the UK and abroad. From 1978-1986, he taught English for Academic Purposes and Applied Linguistics in the Language Centre, University of Hong Kong. In 1986 he became the Director of the new EFL Unit at York; after 16 years of developing the Unit he moved to the Department of Educational Studies in 1983, where he helped to set up the MA in Language Learning and Education. His research currently relates to the use of figurative language, particularly metaphor and recently simile, in discourse and to exploring ways it can be taught and learned. The interest in metaphor tends to relate to advanced level learners and those in higher education. This dovetails with his interest in researching the use of language for academic purposes.He has been part of several systematic reviews of aspects of language teaching and learning, and was a founder member of York’s English Review Group. Currently Graham Low is working with the Institute for Effective Education to review research on Post-16-yr Participation in Full-time Education by members of Minority Ethnic Groups. Todd and Low present a selective survey of published studies that use some form of metaphor analysis and evaluate their methodology and outcomes. The studies selected will help readers carry out their own empirical projects. An overview and critique of conceptual metaphor theory. Conceptual metaphor theory takes a cognitive view of metaphor, and, when it first emerged in the 1980’s, offered a striking new way of understanding metaphor. More recently, scholars have been trying to bring language and discourse back into the picture, combining this with important cognitive developments in, and beyond, metaphor theory. Dr David Ritchie is a professor in the Department of Communication at Portland State University. Ritchie brings together recent developments in perceptual simulation theory, ideas about embodiment, and a concern for the details of metaphorically used language to suggest a more adequate theory of metaphor in discourse. Cameron sets out her discourse dynamics theoretical framework for metaphor in interaction. Using another recent development – complex dynamic systems theory – the framework ties together metaphor in the moment of talk with the emergence of conventionalized metaphor across social groups. Section 3 brings us to the heart of the matter, to the detail of methodological procedures and safeguards, beginning in this chapter with the identification of metaphor . This chapter takes readers through the grouping and labelling of metaphors that leads to finding patterns of metaphor use. This chapter demonstrates how analysis of discourse activity complements metaphor analysis to reveal the functions of metaphor in the production and interpretation of talk and text. Deignan and Semino illustrate how techniques of corpus linguistics and specially designed software can assist metaphor analysis, enabling larger quantities of data to be processed. A corpus is simply a collection of discourse data, usually large or very large in scale, often with millions of word. Corpus software can carry out automatic and very swift searches for patterns of word use across the corpus. Corpus techniques have much to offer metaphor analysis: from straightforward calculations of word frequency to comparisons of metaphor use in the speech community; from supporting the extraction of implied meanings and cultural connotations of metaphors to automatically identifying semantic groupings. Maslen discusses techniques for dealing with the specific demands of studies that produce large amounts of metaphor data. The advantages of large amounts of data in providing stronger evidence or allowing comparisons across social groups must not be compromised by reducing research quality. Dr Alan Cienki is Associate Professor in the Faculty of Arts at the University of Amsterdam. This chapter moves beyond language and thinking to the physicality of gestural metaphor. Cienki illustrates how researchers are including gesture in metaphor analysis, and what this added dimension can reveal to researchers. Low and Todd bring together guidelines for good practice in doing metaphor based research. They set out considerations for studies that require participants to make acceptability judgements about metaphoricity, studies that elicit metaphors from participants, and studies that involve the identification and coding of metaphors in discourse data. Professor Sue Rivers is the Head of the School of Law at Birmingham City University. This is a report of a PhD study that was influenced by the author’s attendance at a metaphor analysis workshop; it demonstrates what an individual can do with metaphor analysis in a small scale study. This chapter connects to the focus group data used to exemplify procedures throughout Section 3, zooming out to the large scale social sciences project with its multiple focus groups and interviews. It demonstrates the kinds of findings available to researchers from metaphor analysis of a large dataset, answering socially important research questions. A ground-breaking collection of research essays demonstrating the crucial role of metaphor in organisation and reconstruction of discourse flow. The volume is a valuable addition to the current paradigm shift in metaphor research. It also delivers an extraordinary attempt to heighten the scientific credibility of metaphor analysis and to make metaphor research more fulfilling and rewarding. This volume is an important contribution to advancing the methodology needed to analyze metaphors found in naturally occurring discourse. Overall, Metaphor Analysis is metaphor-researcher-friendly, and makes a worthwhile theoretical and methodological contribution to metaphor research, in particular ‘metaphor in discourse’ research.